Every experience of worship involves liturgy for the word originates with the Greek term liturgia which means "the work of the people." Applied to worship, liturgy simply means the effort we put into worshiping God and the ways in which we do it. 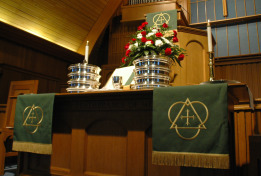 A time of Bible reading and prayer at home and an elaborately planned worship service in a grand sanctuary both involve a liturgy-the practice of our worship. Church. The Ordinary Season of the year, marked by green, follows the growth of the Church and the spread of the Gospel. The color of the season is purple, used to indicate royalty and suffering alike. During Advent, we prepare ourselves for the coming of Christ, both in celebration of his entry into our world as an infant in Bethlehem and ultimately when he returns at the consummation of time. The symbol is comprised of the two Greek letters, chi and rho, the first two letters in the Greek word Christos, meaning Christ. The color of the Christmas season is white, symbolic of purity and light. The Celtic Cross with its circle reminds us of the sacrificial love and eternal nature of God. The color of the season of Epiphany is white, reminder of the light that guided the magi and of our own charge to be light to the world. The Celtic Cross with its circle symbolizes the sacrificial love and eternal nature of God. The color of the day is white, reminder of the light of God’s glory that shined upon Jesus. The Celtic Cross with its circle symbolizes the sacrificial love and eternal nature of God.. 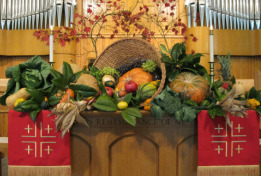 The color of the season is green, a reminder of the life of the church and the growth of each believer. The triangle and trefoil are symbols of the Trinity, reminding us that God is revealed to us as Father, Son, and Spirit. 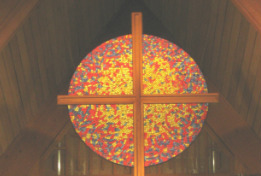 In the center is the cross, the key symbol of the Christian faith, summarizing the life and ministry, death and resurrection, incarnation and coming in glory of Jesus the Christ. The color of the season is purple, used to indicate royalty and suffering alike, a reminder of Christ’s kingship and the suffering he endured for us all. Throughout Lent we undertake a journey of self-discovery leading to repentance and renewal. 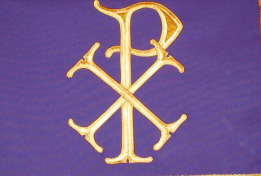 The symbol is comprised of the two Greek letters, chi and rho, the first two letters in the Greek word Christos, meaning Christ. The color of the Easter season is white, symbolic of purity and light and a reminder of the glory of God revealed through Christ’s resurrection . The Celtic Cross with its circle celebrates the sacrificial love and eternal nature of God. Ascension Sunday is the day when we celebrate Christ’s return to heaven and resumption of his unity with God. The color of the day is white, symbolic of Christ’s sovereignty and his compassionate rule over our lives. The Celtic Cross with its circle symbolizes the sacrificial love and eternal nature of God. Pentecost Sunday is the day when we remember how the Spirit of God anointed the disciples and the church was born. The color of the day is red, a reminder of fire which symbolizes the Spirit of God, and of blood which symbolizes the life created and redeemed by God for which Christ and other martyrs of the faith have died. The Jerusalem Cross, comprised of one large cross surrounded by four smaller crosses, reminds us of the spread of the Gospel to the four corners of the earth. On Trinity Sunday we celebrate the three primary ways in which God has been revealed to us as Father, Son, and Spirit and yet is one Being. The color of the day is white, symbolic of God’s sovereignty and his compassionate rule over our lives. The Celtic Cross with its circle reminds us of the Triune character of God revealed to us in God’s essential unity. 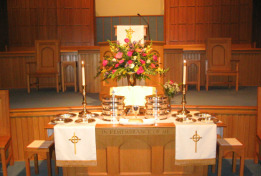 On World Communion Sunday we celebrate our kinship with believers the world over. The color of the day is red, a reminder of fire which symbolizes the Spirit of God and of blood which symbolizes the life created and redeemed by God for which Christ and other martyrs of the faith have died. The Jerusalem Cross, comprised of one large cross surrounded by four smaller crosses, reminds us of the spread of the Gospel to the four corners of the earth. On Reformation Sunday we commemorate Dr. Martin Luther's posting of his Ninety-five Theses on the door of the Castle Church in Wittenberg, Germany on October 31, 1517. Luther’s call for an evaluation of Church doctrine led to the great rediscovery of the good news of salvation by grace through faith in Jesus Christ. The color of the day is red, a reminder of fire which symbolizes the Spirit of God, and of blood which symbolizes the life created and redeemed by God for which Christ and other martyrs of the faith have died. The Jerusalem Cross, comprised of one large cross surrounded by four smaller crosses, reminds us of the spread of the Gospel to the four corners of the earth. On All Saints Sunday we remember the faithful believers who have died and been granted life eternal. The color of the day is white, symbolic of purity and light. The Celtic Cross with its circle reminds us of the sacrificial love and eternal nature of God. On these special days, we use the color red, a reminder of fire which symbolizes the Spirit of God, and of blood which symbolizes the life created and redeemed by God for which Christ and other martyrs of the faith have died. The Jerusalem Cross, comprised of one large cross surrounded by four smaller crosses, reminds us of the spread of the Gospel to the four corners of the earth. For special occasions that remind us of the life God gives us on earth and eternally in heaven, we use the color white, symbolic of purity and light. The Celtic Cross with its circle reminds us of the sacrificial love and eternal nature of God. 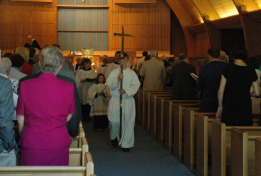 At the beginning of worship, the Acolyte brings light to the altar as a reminder of Christ, the Light of life. 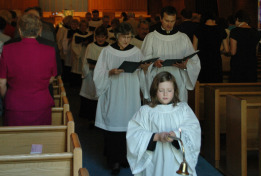 As worship concludes, the Acolyte leads us out of the sanctuary as a reminder that we are to take this light to the world. 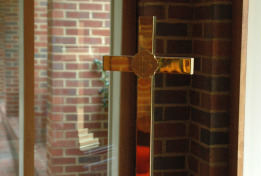 In the same way, we begin and end our worship following the cross as a symbol of God’s self-giving love for us all.